FMB Parents: Did You Miss The Meeting? If a member of your family did not attend the parent meeting on April 7, you MUST read all of this material....to the bottom. *It's going to be an exciting year for the FMB! 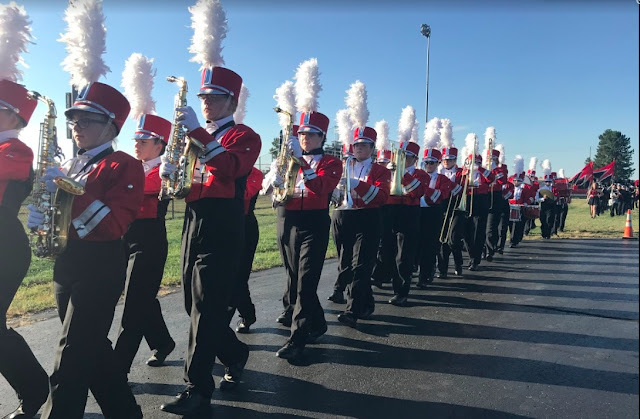 We will compete three times this year, as well as perform at the North Union band festival and Circleville Pumpkin Show. It is a more rigorous schedule, but it was driven by student demand. The kids wanted to compete more and I responded. All of our contest are close to home…Hilliard, Dublin, and OSU. *Attendance at every rehearsal and performance is required. Students taking band for credit will be held accountable in the handbook grading policy and it will be strictly enforced. Except in the case of personal illness, all excuses must be submitted in advance (48 hours for rehearsals and 14 days for performances) and must fit the handbook criteria for an excused absence. Not having a ride, having to babysit, family vacations and the like are not excused absences. Tolles students who are unexcused will be benched or, in worst case, expelled. We are not at our best unless every member is present. You can always find details on the attendance policy and the band handbook online. *Band camp costs $260 which covers room and board, social activities, camp staff, instruction, and camp t-shirt. It is a very reasonable cost compared to many camps and the food and lodging is top-notch, as is your camp staff. You need to make a $50 deposit immediately. By May 28, you must have a total of $100 in your account. The remaining balance is due at band camp check in on August 2. All fees must be paid by this time. You can make a payment at any time. *Band Camp is at Urbana University this year August 2-7. Due to the late Union County Fair, we were forced to switch camp sites this year. Band camp details will be forthcoming in print and on the web page. Urbana’s facilities are well-suited to our group and is close in proximity to the Fairbanks district. A hot/cold tumbler sale will be held the next two weeks. Details are included in this packet. You will be able to earn $6 per item towards your camp fees. *The Music Boosters have some scholarship money available for students who apply, with those in financial need given preference. Scholarship forms are available on the info rack in the band room. These must be turned in by May 30 in the booster mailbox. Evaluations are anonymous, so please do not put any names on the second and third sheets of the application. *You will be asked to help out during the marching season. Please consider working our football concession stand, chaperoning band camp or a road trip, donating food or water, or helping with the pit crew to keep the band running smoothly. If everyone does a little, no on has to do a lot.